We don't just sell clutches, we are the clutch experts !!!! Falcon Automotive Products has been a family run business since 1981. For the past 3 decades we have provided High Performance Clutch and Clutch Specialty work to discriminating customers throughout the country. We have stayed around by evolving with the times, starting out as a clutch rebuilding factory but then developing new clutch business throughout the years. When OEM and aftermarket manufacturers started offering new replacement clutch kits at appealing prices, Falcon Automotive developed strategic alliances with Sachs, Valeo, Exedy, Aisin and Luk as their clutch and clutch part distributors. When customers started asking for High Performance Clutches, we created our own research and development team that has developed our own extensive line of Stage 1, Stage 2, or Stage 3 equivalent Clutches. 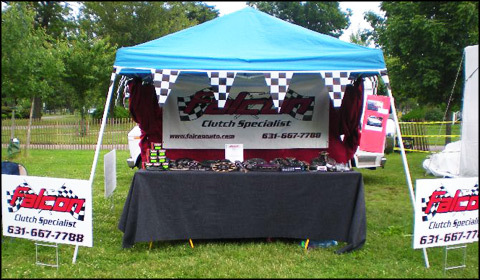 Our high performance clutches are now in high demand with hundreds of car enthusiasts. Recently, we have noticed an increase in demand for our original specialty, the Rebuilt Clutch! Our quality workmanship and attention to detail explains why Falcon Automotive is one of the few quality Clutch Rebuilders whose services are highly sought after. providing top quality High Performance Clutches, and rebuilding your antique, classic, or obsolete clutch. We are now confidently referring to Falcon as The Clutch Specialists, and one clutch related conversation with Falcon Automotive will have you understanding why !